Most of us have either directly or indirectly experienced the effects of the credit crunch that started in late 2008 which is now just starting to loosen up. Banks stopped lending money and credit card companies were looking for any excuse to either drastically reduce your credit limit or in some cases close your account all together with very little notice and without reason. These stories were all over the news, people with perfect credit scores who have never missed a single payment were being treated like second tier citizens by their once beloved credit card companies. I often dismissed such stories as situations that happened to “those people”, something like that could never happen to me, I was an obvious exception to a rule that applied to everyone else. At least that’s what I thought, until I received a letter from American Express stating that my Gold Card that had no pre-set spending limit was being reduced to $2500 due to my most recent credit report. Which essentially translated to we reduced your credit limit with us because we can. This had to be a mistake, I thought to myself. I had my Gold Card for almost 15 years and not once was I ever late in making a payment. I called the American Express customer service line that I actually had in my contacts on my cell phone. Once the representative got on the line I was livid. I have always considered myself to be a great negotiator over the phone, but no matter what I said there was no reversing the decision that had been made. By the time I pressed the “end” button on my BlackBerry my 15-year relationship with my autumnal colored piece of plastic also came to an end. I exchanged my 98,000 points that I accumulated over the years for a measly $400 in travelers checks and decided to part ways with an object that I often identified myself with. I was once proud to have a Gold Card, with its concierge service and elite status. I liked the way it looked in my wallet and I liked its exclusivity even more. But once I realized how foolish I was to give this “thing” such reverence, losing my Gold Card made me find perspective. I stopped living my life in accordance to how a Gold Card Member should and began acting, well...more like me. Then just this last Wednesday something funny happened. 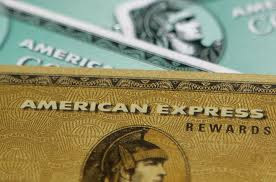 After almost 2 years I received another letter from American Express that read: “We would like to apologize for the misunderstanding that occurred with your account, we have reactivated your status with us. Please give us a call for further details.” A part of me wanted to tear the letter in half and burn in it in effigy but the thought of hearing a mea culpa was too enticing to ignore. So, once again, 2 years after our break-up I was giving American Express a call, but this time I would be the one being negotiated to. They offered me a Platinum Card with 2 years of no annual fees, a savings of almost a thousand dollars. I countered, “Platinum is a little to flashy for me I said, how about we keep it simple and go green instead.” The same offer of waiving the first 2 years of annual fees applied, this time it would be a savings of only 80 dollars. This was not enough for me to forget about the past, so I asked for more. When I hit the “end button” on my phone this time I had a my Amex back in a different color with 2 years of no annual fees plus 25,000 points which is good for a round trip ticket anywhere in the lower 48. I plan on using those free points along with anymore I accumulate to take a much needed vacation. But before the 2 years are up I will make it a point to re-evaluate my relationship with Amex and decide if I want to stay or take my business elsewhere. Why? For the same reason they gave me, because I can. i love stories like this! it took me over a year, but i won a battle with capital one a couple years ago...one of my proudest moments! cheers to your upcoming vacation!! Thank you Joyce! I am certain that you are no slouch when it comes to negotiating with various vendors to get what you are entitled to, in fact I have witnessed it first hand!